It sits there, an amorphous spaceship bending the cityscape at easy will in its brilliant, seamless skin. It could be menacing, with its scale so superhuman, a giant blob of mercury ready to join with another yet to come, then spring back into the form of some mighty alien aggressor. It is perhaps a shiny Trojan horse from some place with no loss for intelligence (and with, no doubt, a dangerously elegant aesthetic). It is the shape of an invader H.G. Wells would imagine if he himself time-travelled to the age of Jerry Bruckheimer and DreamWorks Pictures. It could be menacing, that is, were it not for the seagull perched on top, eying the world below for an errant French Fry, or for the camera-flashing adults rushing up to it until their images invert, float and contort, or for wavy lines of school kids pressing tiny hands against this deliciously large funhouse mirror. It is, instead, a giant sleek Airstream trailer from some other-worldly happy campers. 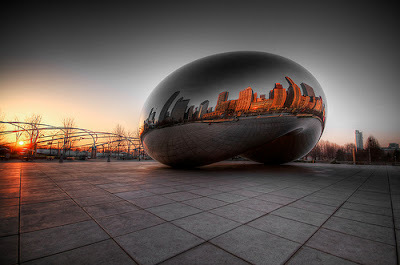 It is the Cloud Gate, one of the crown jewels in Chicago’s very big crown, Millennium Park. And so unmenacing is this piece of public art, it has been nicknamed “the Bean.” On my first visit to Chicago (when and where I became an instant fan) I spent a sunny day touring the park, and had to be torn away from the two works of art commissioned for it, so engaging and purely beautiful were they both. It made me wonder… what makes a piece of public art great? Why do some so brilliantly succeed when others flounder or become an odd afterthought, more roadside oddity than piece intended to mark our moment in time and culture? What makes public art works work? I looked to some of my favorite pieces to see if there were any common denominators, and found there were. In doing so, I came up with a short list of pieces I think are worth visiting. To some degree, all these examples possess some measure of all these criteria for success (well, okay, Mt. Rushmore lacks a bit for subtlety and minimalism), but the success of each seems to owe much to one specific trait of success. Each day this week, in no particular order, I'll be listing my top 8 picks. Tomorrow, more on how Cloud Gate uses interactivity, and a little of our vanity, to make it on the list. Ask Patrick has been nominated for Best Writing! I'm a Houzz Influencer! Find and Follow me on Houzz! Interior designer, tastemaker, stylist and stager. As seen on HGTV, "Small Space, Big Style" and "Rate My Space." Featured on HouseBeautiful.com. Winner of the ApartmentTherapy.com first annual "Smallest Coolest Apartment Contest," winner of the Bloomingdale's "Big Window Challenge," with interiors appearing everywhere from the cover of Florida Home & Garden to the pages of Ladies Home Journal. Interior blogger, writer, interviewer and diehard interior enthusiast.